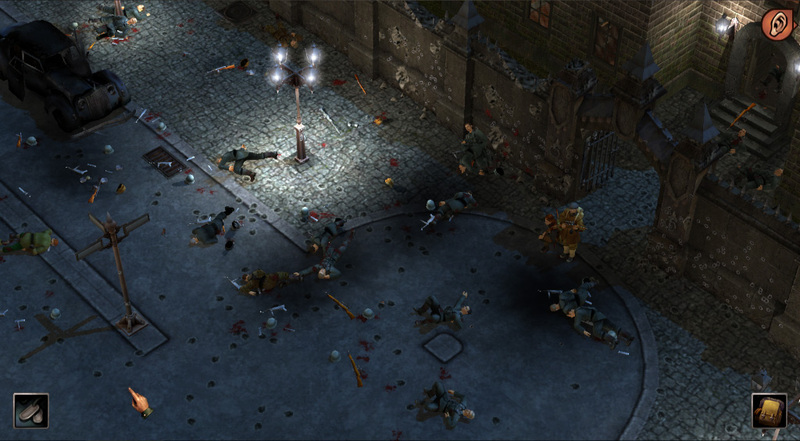 Silent Storm is a turn-based tactical combat game for the PC, in which the player controls an elite commando unit during an alternate universe World War II. (The fantasy setting becomes more obvious later in the game as the existence of various improbable experimental weapons is revealed.) 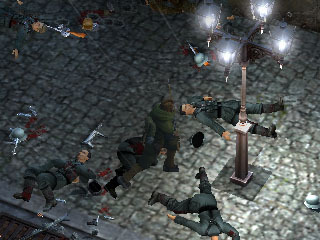 The game was developed by Russia’s greatest PC games machine, Nival Interactive (Etherlords, Blitzkrieg, HOMM V) and released in 2003. 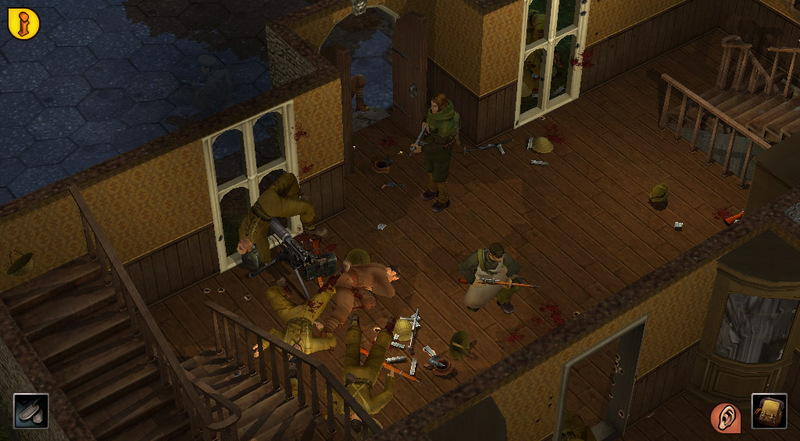 The game takes the basic mechanics of turn-based squad games (as seen in Laser Squad, X-Com and Jagged Alliance) and grafts them on to a deeply physically simulated 3D environment. 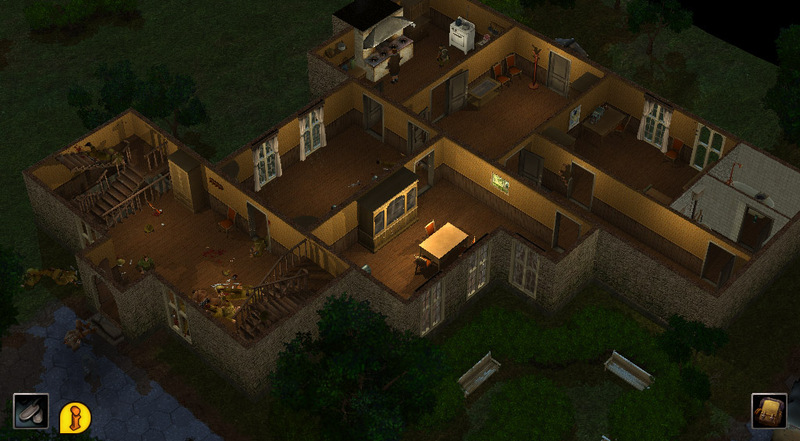 The game’s major innovation is the completely destructible nature of the environment. Everything in the game (and this isn’t just limited to scenery objects or specially designated ‘weak’ walls) has material properties and can be destroyed with a sufficient amount of force. Destruction isn’t a binary state either. 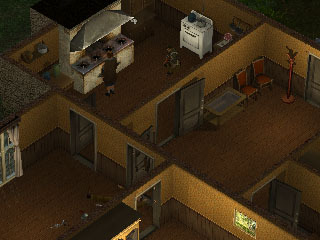 The game’s buildings are made up tile-based sections, which are further subdivided into individual pieces, so bullets and explosions can carve irregularly shaped holes in walls and floors. This makes the idea of cover a relative concept. If you can hear someone on the other side of a wooden door, you can quite happily loose a hail of sub-machine gun bullets through the door in their direction (albeit with limited in accuracy). 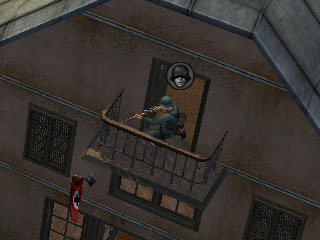 You can concentrate fire on part of a building to give your sniper a clear view of the goons inside. (Everything works on true line of sight.) 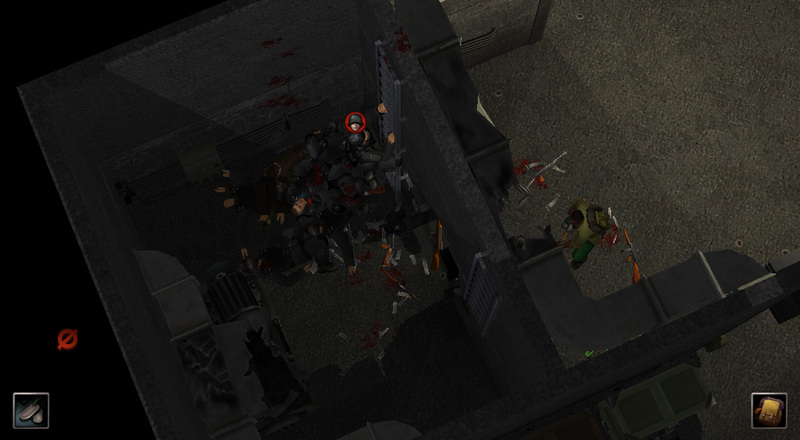 Blast a big enough hole and your soldiers will naturally be able to clamber or crawl through it, so you seldom have to confine your route to the existing staircases, ladders and entry points. The malleable nature of the world doesn’t just add to the gameplay, it is the gameplay. 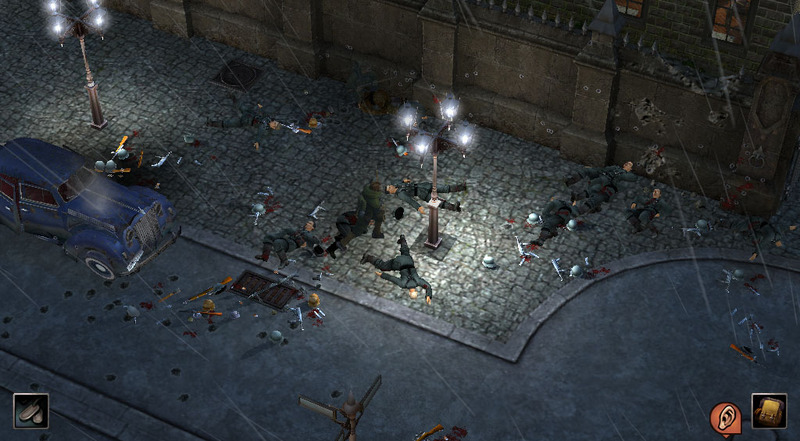 It sets Silent Storm apart from previous entries in the genre. 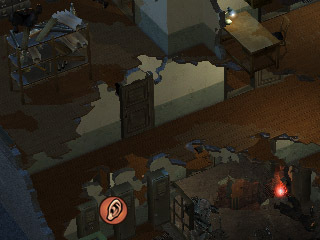 One could easily imagine 2D games like Laser Squad or Jagged Alliance being implemented with miniatures and dice, but it would be impossible (or at least staggeringly impractical) to recreate Silent Storm’s design in this way. The other distinguishing aspect of the game is the inclusion of what the developers call “RPG elements”. These essentially consist of a set of stats and a skill tree for each member of your squad. Characters aren’t constrained to their starting classes, so it’s possible to build up their stats in other areas without penalty. Apart from the ‘hero’ character (for whom the player can specify a name, face, voice, gender, nationality and starting class), the rest of your squad is recruited from a pool of predefined characters. 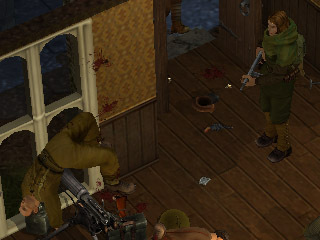 Unlike Jagged Alliance, there’s no personality system preventing certain characters from working together or causing them to bear grudges. The glue that holds the missions together is perfunctory but adequate. 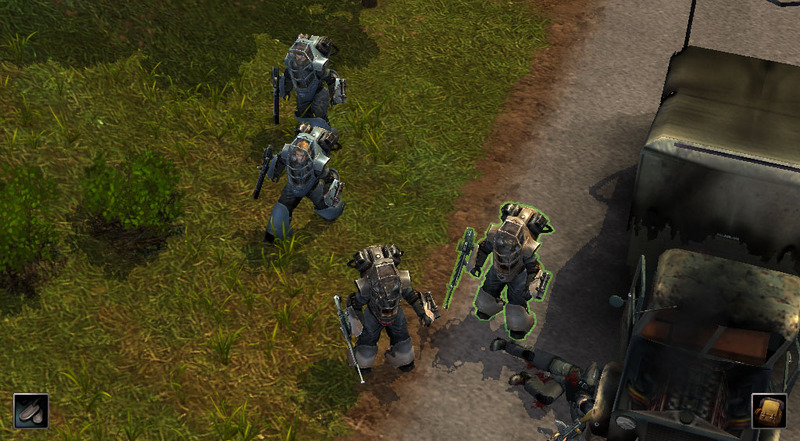 The campaign system adds new plot-advancing missions to the game map which can be tackled in any order. 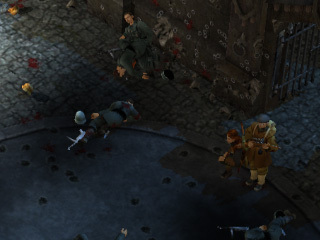 Completely optional random encounters also appear on the map, which can be useful for increasing your characters’ stats and gaining a little extra ammo and equipment, but are typically so short and simplistic that there’s not much point in opting to play them once you have a few of the main missions under your belt. 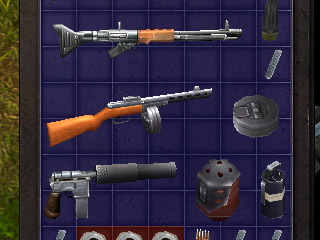 There are dozens of weapons and items available to equip your squad, which can be obtained in the field or from the generously stocked armoury at headquarters. There are at least 10-20 of each of the main weapon types (mêlée, pistols, rifles, submachine guns, heavy weapons, grenades) as well as loads of medical (bandages, forceps, morphine) and engineering (lockpicks, explosive charges, landmines) items. As well as the usual variables for each weapon (clip size, weight, power, firing speed, etc.) there’s also a stat for how easy the weapon is to learn. Individual characters gain greater familiarity with the weapons they use most often. Equipping a squad prior to entering a mission is quite engrossing and offers lots of scope to indulge obsessive-compulsive tendencies. 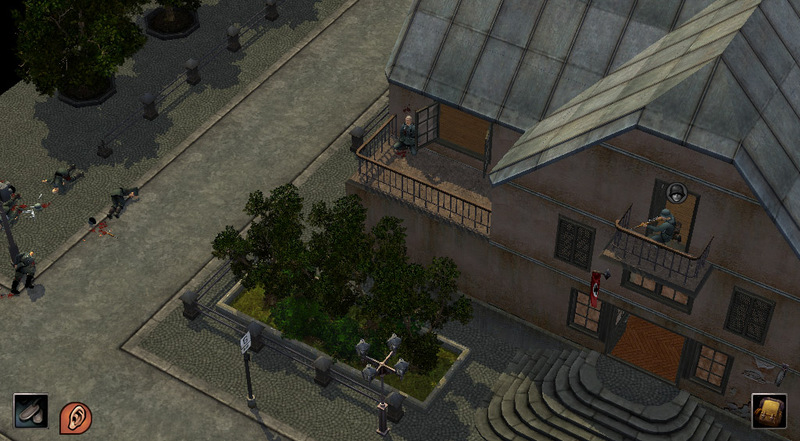 The range of skills and weapons available, combined with the level of detail in the simulation, affords the player an enormous amount of freedom in how they approach each mission, similar in design ethos to the Hitman games. The particle effects and rich, hand-painted looking texture work (Nival’s visual trademarks) are typically excellent, as are the ragdoll deaths (quite a new development at the time). The scenes left in the aftermath of particularly eventful missions, of battle-scarred, semi-collapsed buildings strewn with corpses, are eerily reminiscent of the Chapman brothers’ Hell dioramas. In spite of the brilliance with which the core gameplay is implemented, Silent Storm does have it’s fair share of shortcomings. The most glaring is that there are no multiplayer modes, a staple of the genre since the early days, and something which would seem easy to implement (at the very least offering hotseat or play by email). Enemy turns can take an excessive amount of time (partly because their animations are played out at the normal speed when you can see them). On levels where there are several friendly AI characters and enemies engaged in battle, you can spend more time watching them duke it out than actually making your own moves. 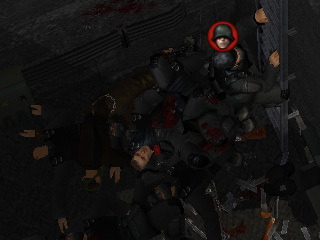 The enemy AI also has some issues. 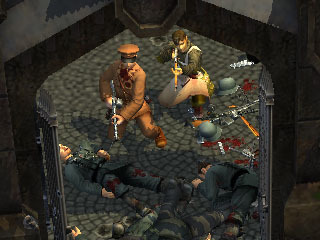 Pathfinding (for enemies and the player’s squad) is handled excellently, but enemy characters lack much sense of self preservation or awareness, seeming happy to charge through doorways that are already littered with corpses of their comrades (as seen in the image above). They also seldom use stealth (although they tend to be absolute bastards on the rare occasions where they successfully ambush you) and don’t seem to be able to use grenades. Because of these problems (as well as the issues described at the end of this article), and the fact that it all does ultimately get a bit predictable, I would expect that most players would play the game until they reached a point where they’ve had enough, rather than fall victim to 100+ hour addictions. Silent Storm is a game that unfortunately passed most people by on its original release. The game failed to find a wide audience thanks to a combination of bad timing, poor marketing and what at the time seemed like excessive technical requirements (especially for a strategy game). JoWooD (who were originally slated to publish the title) were in financial difficulties around that time, and sold off the publishing and distribution rights to various external parties. 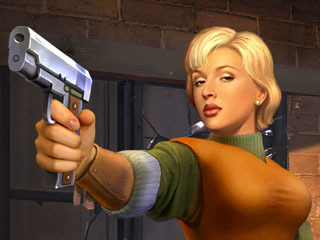 The fact that the game was turn-based was considered a problem when it came to marketing. With the unstoppable rise of the RTS over the past decade, it has become extremely difficult to even get a turn-based game released, let alone to generate commercial and critical interest. In recent times only Nintendo (and to some extent Atlus) seem to have been able to buck the trend, with games like Advance Wars and Fire Emblem. It’s disappointing that Nival haven’t built on the advances made by Silent Storm with a true sequel. (They did release at least one other game with the same engine, Hammer & Sickle, which seems to be an officially sanctioned mod.) 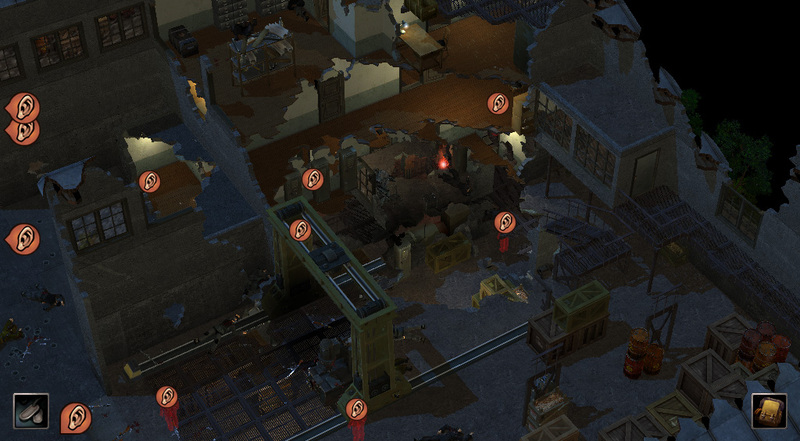 It’s also a shame that there haven’t been any subsequent games in any genre that implement destructible environments as extensively. 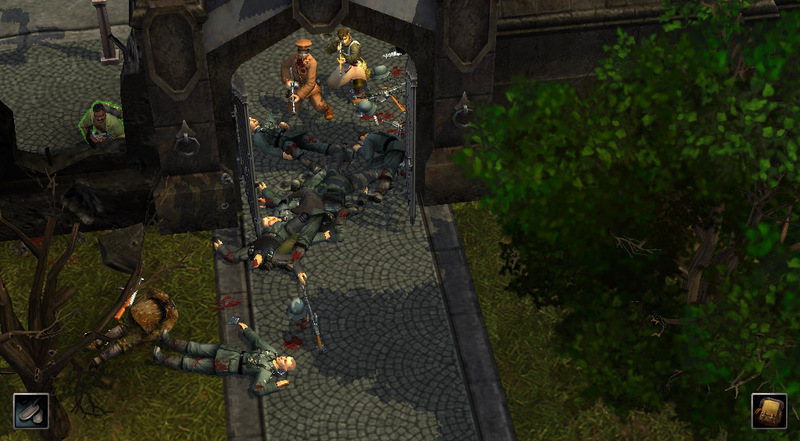 Destructible scenery in games is usually severely limited due to a combination of expense and time constraints, design issues (it becomes vastly easier for the player to break the game in ways the designers hadn’t anticipated), and historical technical reasons (most graphics hardware and APIs are primarily designed to optimise the rendering of static environments). It occurs to me that turn-based tactical strategy games would be ideally suited for episodic delivery. Games like Front Mission and Faselei!, with a strong narrative focus, give a good idea of how a mission or mini-campaign could be packaged up as a stand-alone experience. It might not even be strictly necessary for the player to play through every episode in order, and they could carry over their characters and equipment from one episode to the next. (Obviously some balancing issues would be need to be addressed.) Replayability would be increased if there were secondary (or hidden) objectives and multiple ways to complete the mission. Such a game would probably need well-written (and quite varied) characters to keep players interested. I’m not aware of any developer currently exploring this route (the most actively developed game in the genre today appears to be Laser Squad Nemesis, which focuses on multiplayer), but would be very interested to see how it could work. Spoiler warning: Some later developments in the game are discussed beneath the fold. 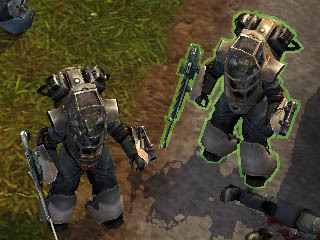 The storyline of the main campaign leads towards the revelation that both the Axis and the Allies have developed mechanised armour suits termed Panzerkleins (PKs). 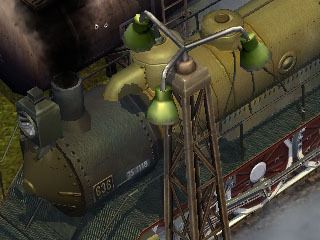 The Allied variety look like heavy armour suits with WWII fighter plane segmented cockpit windows, while the Axis models look like the steam-powered Koubu from Sakura Wars. The game also introduces laser weapons which complement the Panzerkleins. 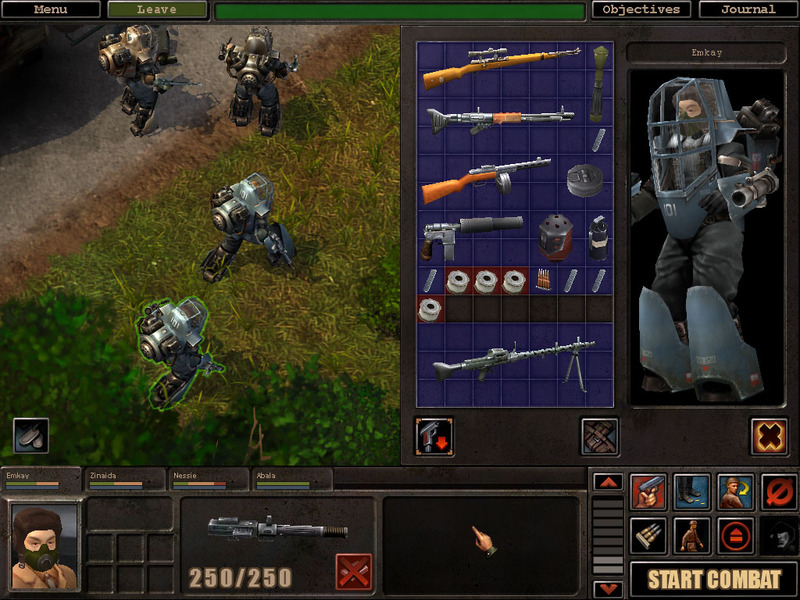 These suits and compatible weapons can be obtained by the player. 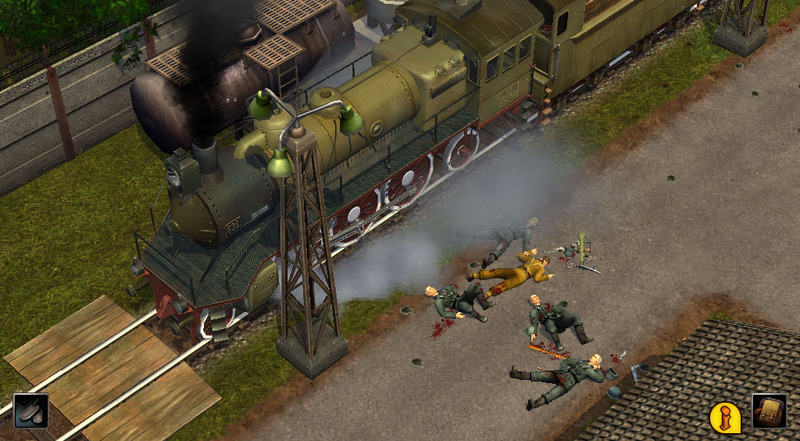 Many players are critical of the introduction of Panzerkleins, claiming that they unbalance the game. This criticism is well-founded, as enemies without panzerkleins pose almost no threat whatsoever to a PK-equipped squad. The panzerklein weapons are dramatically more powerful and accurate than the conventional equivalents: the PK sniper rifle can easily kill with one shot from the other side of the map, and the PK heavy machine guns can rip through multiple concrete walls as though they were moist bread. Their casual destructive power actually makes some later missions (involving civilians that must be kept alive, and objectives that require an accessible route to be obtained) almost intractably difficult unless they are used sparingly.